U Can't Anvil The Truth: Was The Titanic Ever Built??? 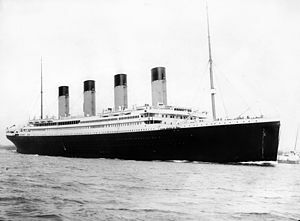 Is it possible that they didn’t build one whole ocean liner and that the whole story of the Titanic and her sister ships were manufactured by the mainstream medias. If this scenario is true then it shows the power of the printing press and the people willing to dupe the public with manufactured historical events. The story is coded as the Titanic hits an iceberg at 11;40pm and 2hr 40min later sinks which when you do the math and find out the time in minutes and seconds...you can conclude that the event was faked.The date decode in the photo is more evidence of a scripted event told through the newspaper and radio broadcasts wherever available. The numbers reveals a fictitious boat builder company and owner which leads me to think that they didn’t build the whole ocean liner but parts of it for the newspapers to have some aspects in which to manufacture the deceptions and lies.